Panasonic has announced its 2010 range of Blu-ray Home Theatres – with the SC-BT735, BT330, BT230 and BT222 offering what the company terms a 'realistic' cinema surround experience. Panasonic's latest Blu-ray bundles use a combination of real and virtual speakers to try to bring a little cinema magic to your front room and the entire range incorporates PHL Reference Chroma Processor Plus for more accurate colours. The SC-BT330, BT230 and BT222 all feature the new Advanced Bamboo Cone Speakers as Centre speakers. "Kelton Subwoofers with their distinctive design are included with the BT735 and BT330 in order to deliver a powerful, reverberating bass despite of its small, compact size," adds Panasonic's release. 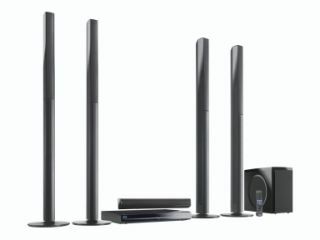 The BT735, BT330 and BT230 are also wireless ready for the rear speakers and feature VieraCast, BD-Live, DLNA capability, and are Wireless LAN ready. That connectivity means that users can view videos on YouTube and Web-based photos on Picasa via VieraCast as well as download BD-Live Blu-ray Disc bonus content. Panasonic also announced that its Full HD 3D Blu-ray Disc Home Cinema System which features Pure Direct Sound Speakers, Full HD 3D playback with 1920x1080 frame-sequential method, VieraCast, and BD-Live, will be coming in Autumn. The BT735 has a price of £698, with a UK release date expected shortly.